The father of a young, nonverbal boy compassionately reviews the true value of new year’s resolutions. A speech-language pathologist, parent coach, and autism expert describes ways to integrate communication supports into a child’s daily environment. Meet 16 outstanding contributors who earned special honors for their contributions to Autism Parenting Magazine over the past year. A psychologist and mother to a young son with autism explains the value of augmentative and alternative communication (AAC), partnering, and creating multiple communication opportunities. Mothers of girls with Asperger’s can learn excellent insight in preparing them for employment from an organizational researcher and former human resources director. The author of the new children’s book The Waiting Song explains why autism awareness is key for people of all ages and how it can lead to love and acceptance. Learn about the long-term benefits of exercise with autism as well as activities you can modify or adapt to meet your child’s needs. Learn tips on ways to help your child’s teacher better understand autism and common behaviors. A writer and college student with Asperger’s syndrome shares constructive ways to handle anxiety. Read professional advice on how to use mindful parenting to reduce stress, depression, and aggression while changing brain regions associated with emotional regulation, introspection, and awareness. The mother of a young girl with special needs shares why it’s vital families find opportunities for quality respite so the entire family can grow. An educator uses his experience parenting a son with autism in this narrative to provide a glimpse at family life. A mother of three boys, the oldest of whom has autism, shares six supportive ways people can help families affected by autism as well as understand their daily needs. Meet autism advocate Arabella Carter-Johnson, founder of the charity called The Little Explorers Activity Club and author of the best-selling book Iris Grace. The mother of a child with autism shares excellent ways to support siblings of people with special needs. Learn how children with autism can easily learn about life through the Jungle Jam children’s book series. Be inspired by this innovative company that employs people with special needs to help produce healthy gourmet slow cooker spice blends. How Do You Teach Your Child With Autism Self-Esteem? An educational therapist specializing in autism enthusiastically responds to a reader’s question regarding the need to build a child’s self-esteem. This book provides great tips on how to advise young people with autism to manage their money well. Read a special interview with the proud parent of a 19-year-old son with autism, who is now a college student and an Eagle Scout. Learn about a product that uses light modulation technology to allow the embedding of soft light pulsations for specific interaction with a person’s various physiological rhythms. A woman warmly shares how her friend with autism greatly benefits from having animals in her life. This new book by Gitte Winter Graugaard provides reassurance and comfort for children with autism, enabling them to drift off into calming, reparative sleep. In her new book, Dr. Alisha Griffith shares her journey with her son with autism as well as insightful communication and self-help methods for families affected by autism. Ryan F. Platt provides expert advice on ways to help a child with autism financially prepare for the “real” world. It’s a new year! A fresh start! A new journey! It’s always an exciting time here at Autism Parenting Magazine as we review our year and enthusiastically plan for the future. We are always thrilled to hear from you, our readers, as you share both the struggles and the victories of your journeys. Your questions help us define much of our focus: How can I help someone with Asperger’s handle anxiety? 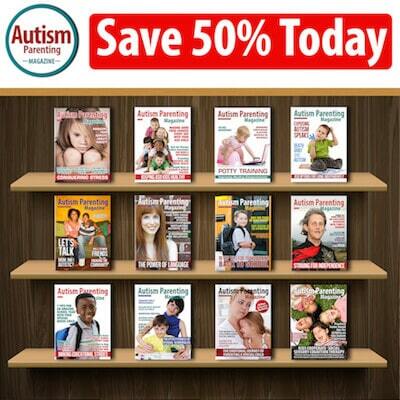 Is there a way to help my child with autism spectrum disorder (ASD) better communicate? How do I improve my child’s health? How can I manage my health when I feel so overwhelmed? In response to these tough questions, we are thrilled to share an impressive selection of articles this month. First, let’s take a look at James Guttman’s poignant piece called Why Not Pledge to Cut Yourself Some Slack In The New Year? as the father of a young, nonverbal boy with autism discourages parents from making impractical resolutions for the future. His perspective is always so fresh and inspiring. We all know parenthood is a demanding occupation. How would you say you manage the constant pressures and expectations? Susan M. Taylor, JD, an educational and legal writer with a family member on the spectrum, has some terrific advice you don’t want to miss. In her piece, Ways to Use Mindful Parenting to Overcome Frustration and Stress, Susan discusses how utilizing mindful parenting can help you reduce stress, depression, and aggression while changing brain regions associated with emotional regulation, introspection, and awareness. Do something for yourself and take a look at her guidance. Do you need some advice on constructive ways to handle apprehension and angst with Asperger’s, or know someone who does? We are happy to share Alan D.D.’s article called How to Deal with Anxiety and Asperger’s Now as the college student shares his tips on how to handle uncomfortable moments and better process anxiety. What about taking care of yourself? Do you tend to put your own needs last? As the mother of three children, Emily Davidson used to be the same way. Emily said she felt like she was constantly going in circles trying to please and finally realized she needed to give both herself AND her special needs daughter a break. Please read When Loving Your Special Needs Child Also Means Taking Care of Yourself as Emily shares why it’s essential for families to research opportunities for quality respite. Finding ways to stay in shape can be a huge topic for families as extracurricular activities and team sports can be overwhelming for some kids with autism. Finding new ways to exercise is essential as the Centers for Disease Control (CDC) estimates one in five children aged 6-19 years is considered obese, and research indicates this number may be higher for children with autism. Please take a look at Alescia Ford-Lanza’s article called Finding the Best Exercise To Fight Obesity with Autism to learn about the long-term benefits of exercise as well as activities you can modify or adapt to meet your child’s personal needs. The whole family can enjoy and benefit from many of Alescia’s ideas. A large percentage of people with autism find communication a challenge—that’s why we’re eager to introduce you to a couple of important contributors this month. First, meet Rachel Madel, a speech-language pathologist, parent coach, and autism expert who has written an article on great ways to integrate communication supports into a child’s daily routine. Rachel does an excellent job providing straightforward guidance in Easy Ways to Add Simple Communication Strategies to a Kid’s Life. Are you familiar with the benefits of augmentative and alternative communication (AAC)? We also want you to get to know Ewa Omahen, a psychologist and mother to a young son with autism, who has provided an article on ways AAC can enhance receptive language and facilitate social interactions, as well as reduce behavior problems and support learning. Take a look at her piece Amazing Ways AAC Can Improve Communication for Your Child, as Ewa describes the value of communication partners and ways to produce amazing opportunities for communication. In addition to providing you with answers to your questions concerning autism, we are proud to highlight our top 16 contributors for 2017. 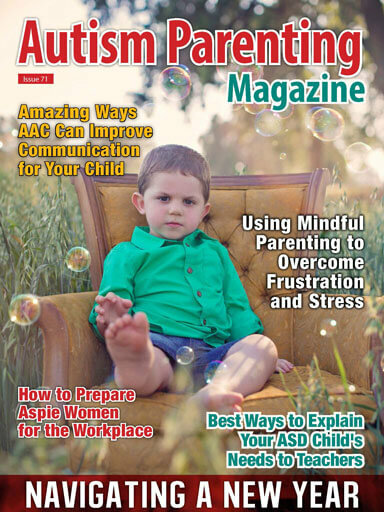 Autism Parenting Magazine continues to grow, and we are thankful for the hundreds of contributors, including dedicated physicians, scientists, educators, families, and writers who are on the spectrum. We are proud of the strong autism community that has developed over the years, and together we make a difference all around the world. We are also thrilled to introduce you to our January Cover Contest winner, four-year-old Ryder, who has been diagnosed with severe autism, speech disorder, and sensory processing disorder. His mother, Cassandra Bakker, describes him as an outdoor boy who loves playing in the dirt and swimming. When indoors, he prefers music, books, trampolines, and his blankets. She said Ryder is the hardest working boy she knows, but also the happiest! Cassandra won back issues worth $239. Wishing you a happy new year filled with kindness and unwavering support. Always reach for the stars and celebrate the victories.